Do you fear knits? Then you will be so excited about Rae's (over at Made By Rae) KNITerviews series! She's gathered a slew of seamstresses and asked them to share their deepest, darkest, stretchiest knit secrets. 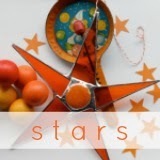 I'm there today as her interviewee and sharing a knit project here today. Start by cutting out two diagonal pieces for the top, coming down to mid-rib cage. Make sure they mirror each other. Cut out strips for the edges from contrasting knit fabric 3 times the width you want the desired finished edge. Stitch, right sides together with a slight zig-zag stitch. Fold the edging around to other side (no need to fold the raw edge under since it won't fray). Pin and sew on front side with double needles. (Here's a tutorial on using a double needle). Overlap front pieces and bast along sides and bottom to keep together. Cut out the bottom portion of the shirt as well as the back. Sew edging on the back neck like you did the front. Sew front top and bottom togther with a slight zig-zag stitch and the top stitch with the double needle. Sew front and back pieces at shoulders. Trace sleeve onto paper. Cut it mid cap and tape onto another piece of paper. This was a size 10 and I spaced the pieces about 3 inches apart. 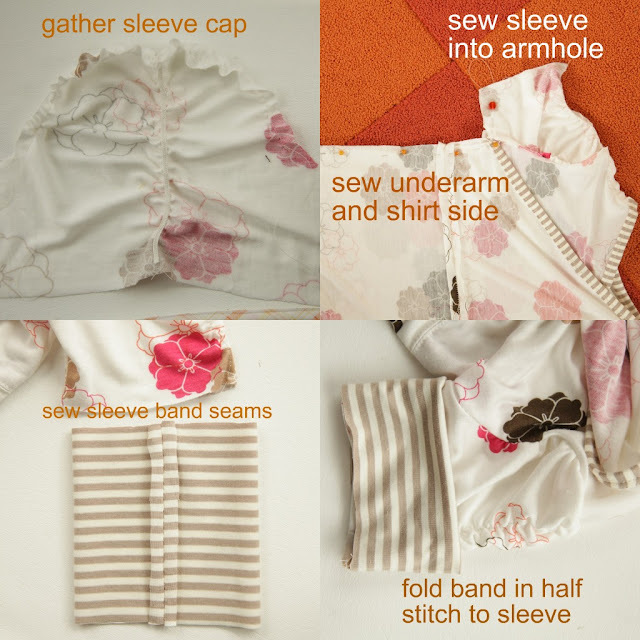 Connect the two and cut out sleeves. Cut a 1/8-1/4" piece of elastic about 5", pin to top and bottom center. Anchor the top with a couple of stitches and then pull sleeve and elastic while you stitch down the center. Next gather the sleeve cap and stitch into the shirt. 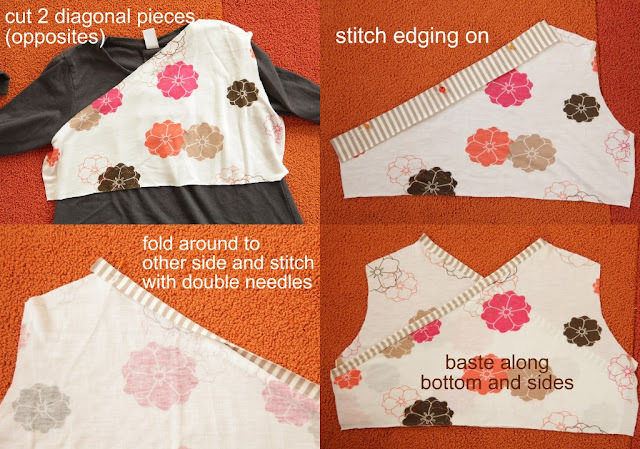 With right sides together, stitch underarm and shirt sides with a slight zig-zag stitch. 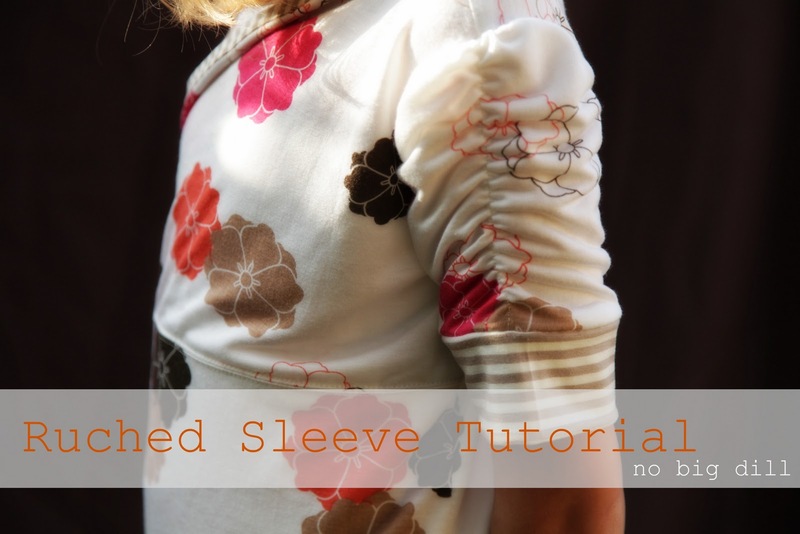 Cut arm bands twice the width you want the finished width and the same length as the arm hole. Stitch band together and the fold in half (wrong sides together). Place over sleeve and stitch with a slight zig-zag. Finish hem by folding up an inch and stitch with the double needle. Voila! Um, that is super cute. I didn't realize until the first modelled pic that it was for one of your baby dills and my first thought looking at the tut was "I'm going to make that! Adapted a bit to be a maternity shirt!" after a brief hesitation realizing the tut was for a kid project, I'm thinking I still am! Laura--Yes! Absolutely! It could work for a whole bunch of different projects. Really cute! Thanks for the tutorial. love the top . . . love the knit print! Do you remember where you bought that print? I can't ever find cute knits in my local fabric store. Perhaps you have an on-line favorite store for cute prints like this? Thanks! Great interview! Love the sleeves and shape of the shirt at the bottom. I totally tried to make a sleeve like this once but didn't have enough fabric (I was refashioning a turtleneck) and the fabric was flimsyish and didn't stand up to unpicking that elastic very well. (I am a bit of a hasty unpicker sometimes). Ooooh! My mom is here this weekend and she can sew like you can, I may just get her to help me try this! Thanks for the source tip, Katy. I'll give it a try! Pinned it! I'm thinking this may be my next project! Thank you thank you thank you!!! I'm so excited to try this!